Find the perfect Valentine's Day gift with Candy you ate as a kid®. If someone is special in your life then something sweet might be the perfect gift. Bring them back to the cherished days of their childhood, or relive a treasured memory you both once shared together. All of our Valentine candy gifts are available with a free, hand-written gift card similar to the ones you see at a florist. Enter your message during checkout. And yes, they are really hand-written by one of our candy ladies. 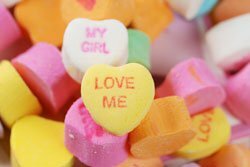 Delayed Delivery: Order your Valentine Candy Gift today and delay delivery to arrive in time for the event. Look for Delayed Delivery during checkout. By the 18th century, the tradition of giving gifts and exchanging hand-made greeting cards on Valentine's Day had become common in England. Valentine cards were made of lace, ribbons, and featured cupids and hearts. Eventually the practice spread to the American colonies. The tradition of Valentine's cards did not become widespread in the United States until the 1850s when a native of Worcester, Mass., Esther Howland, began mass-producing them. Today, of course, Valentine's Day has become a booming commercial success. According to the Greeting Card Association, 25% of all cards sent each year are valentines.